Rotherham United will have woken up on Sunday and still not believed they managed to win this one. For the best part of 80 minutes the Millers were outplayed by Swansea and would have considered a 1-0 defeat a pretty respectable scoreline, such was the visitors' dominance. How they only had Oli McBurnie's first-half goal to show for their superiority boss Graham Potter will never know, but it cost them due to nine minutes of madness at the AESSEAL New York Stadium. The Millers have had their fair share of grumbles at referees this season but they cannot complain about Tony Harrington, who awarded them two penalties, the first of which was extremely soft. Still, Paul Warne's men were due some luck and Ryan Manning made the most of it, firing both spot-kicks into the same corner. They were his third and fourth penalties of the campaign and it now makes him the club's top scorer. 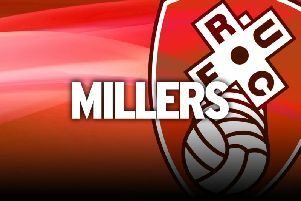 They were also the difference between the Millers sitting second from bottom and being without a win in eight games and now being unbeaten in four and occupying 18th position. “I thought we were completely outplayed in the first half especially,” Warne conceded. “In fairness to the fans, I appreciate that we didn't get booed off at half-time. Sometimes you just have to hold your hands up. The Swans had taken the lead when the impressive Daniel James, who gave Millers right-back an opening 45 minutes he will not forget in a hurry, teed up McBurnie to convert from close range. James fired over while the reliable Marek Rodak produced fine saves to keep out Bersant Celina and Leroy Fer either side of half-time and Jay Fulton and Celina also missed the target. Then came the carnage, starting in the 79th minute. First Harrington generously pointed to the spot when goalkeeper Kristoffer Nordfeldt was adjudged to have bundled Jamie Proctor to the ground. Nordfeldt got a hand to Manning's penalty, but the net rippled, as it did even more emphatically with his 87th-minute effort, awarded for a handball by Fer, and the turnaround, no matter how unlikely, was complete. "Swansea were very, very good,” said Warne. “Sometimes you have got to hold up your hand and admit the opposition played better. Today was definitely one of those days." Swansea were the better team, but it was the Millers who had the last laugh.